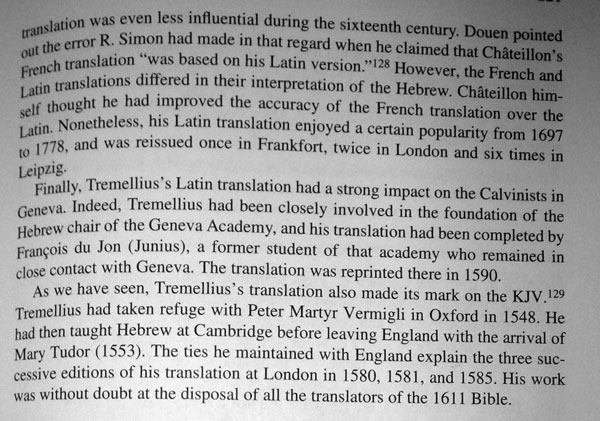 Yesterday, I talked about Dominique Barthélemy’s newly-translated book on Hebrew text criticism, Studies in the Text of the Old Testament: An Introduction to the Hebrew Old Testament Text Project (STOT). Suzanne added a comment to my post, expressing her concern that modern scholars often ignored the work of Santes Pagnini and Arias Montano. 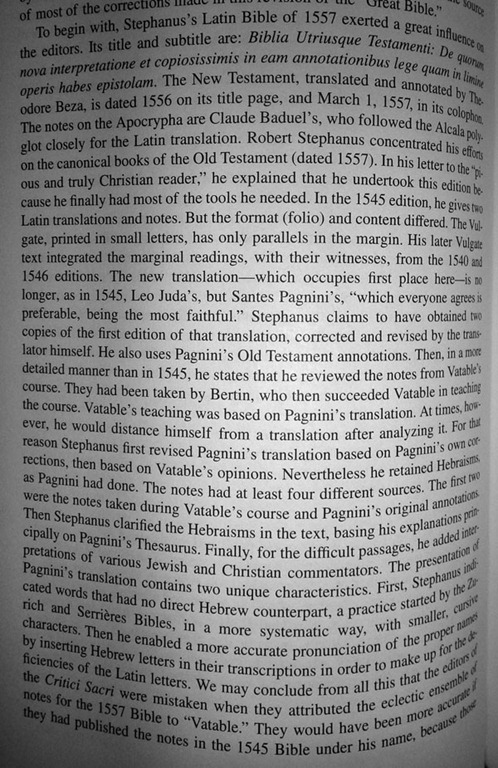 This may be an issue for some books, but certain not for Barthélemy’s work, who for example discusses Pagnini in over a dozen separate passages, some of them up to four pages long. Indeed, as I was reading this book, I thought it would be especially appropriate for Suzanne given her academic interests. 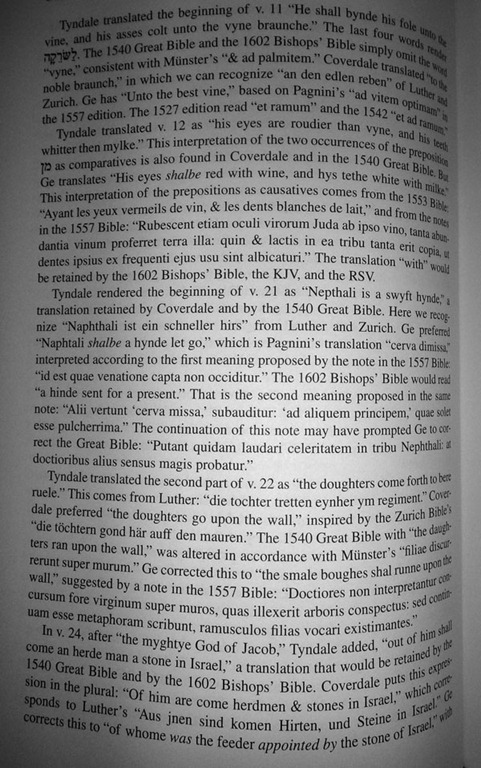 Below are just a few (there are many more) of the examples, tracing the influence of different translations. I must beg forgiveness in advance for the poor quality of the images. The book itself is quite beautiful, but I was not able to properly photograph it. 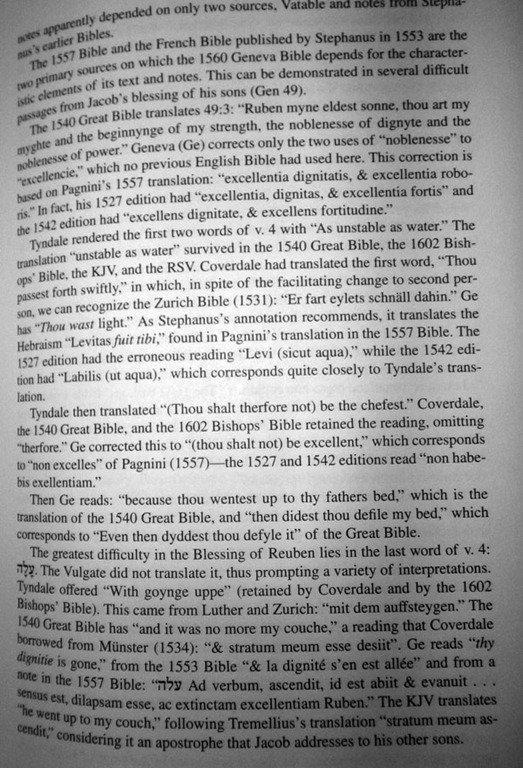 Now a discussion of some specific passages influenced by Pagnini in early English Bible translation. Fascinating that Calvin and friends could put to death the “heretic” Servetus but still make good use of his presumably confiscated collection of books! Somehow I think the Catholics would have burned the books as tainted, but for these Protestants books were sacred. Not to be outdone, the Catholics also regarded Servetus as a heretic and burned him in effigy (again, with his books) in Vienne. But you are right — even though Calvinists and Catholics burned his writings, in Geneva they allowed his library to survive. Thank you so much for this. I did comment but deleted it when I realized that Barthélemy must have been working with the Pagninus and Montanus translations. 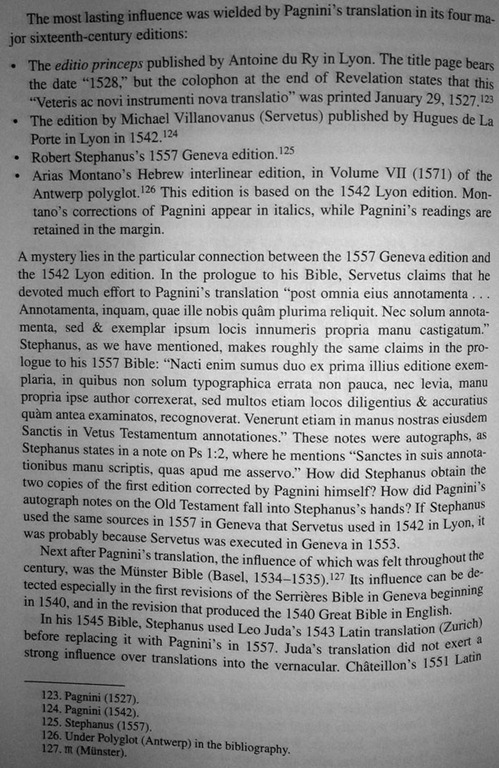 Pagninus’ along with the Zurich Bible and Luther, all provided a base for Tyndale and influenced the Tyndale lineage of Bibles. I was once shown a copy of Vatable’s notes and asked if I wanted to do a dissertation on them, but I was not able to undertake that study at the time.